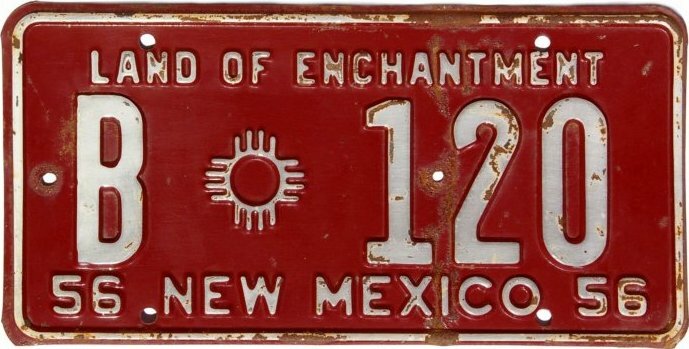 1930 was the only year that New Mexico had a license plate that was explicitly embossed “BUS,” and from the information found on their weight/capacity seals one can infer that they were used for both buses and taxis. This plate was superseded in 1931 by the C-prefix commercial plate with either a “Taxi” or “Bus” seal affixed. Taxicabs: Motor vehicles for the transportation of persons for hire, having a normal seating capacity of not more than seven persons. Bus: Motor vehicles for the transportation of persons for hire, having a normal seating capacity in excess of seven persons. There might be little difference in the appearance, therefore, between a 7-passenger taxi and an 8-passenger bus. And an examination of the seals on these plates shows that they don’t always follow the above definitions. Photo Credits: 1932 Bus courtesy Alan Betts. All others by Bill Johnston.